CLICK HERE to view our catalogue and suppliers website. Let's face it - it's notoriously difficult to find suitable blinds for tilt and turn windows. Based in Filton, Bristol, our company has the solution. The stunning Intu™ blinds we supply are designed to act as tilt and turn blinds. 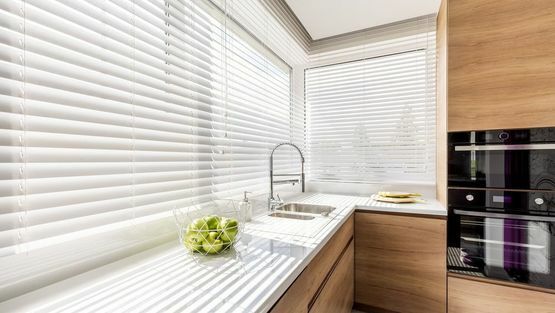 Precisely fitted to the shape and trajectory of your window, these blinds never fail to look exceptional. The Intu™ blinds system is effortlessly fitted to uPVC windows without the use of screws. That means you won't have to suffer unsightly holes drilled into your precious window frames. Ideal for tilt and turn windows, these innovative blinds are also perfect for doors and conservatories. Available for screw fits and timber window frames, these easy-to-install blinds are fitted by our practised team of blind installers. The blinds that accompany our impressive Intu™ systems are primarily Venetian. However, roller blind variants are also available with some limitations. Because these remarkable blinds are fixed against the glass, there's no need to worry about marks, holes, or other cosmetic imperfections. Instead, you're free to rest assured that your blinds are out of harm's way while performing their function to maximal effect. Neat, tidy, and attractive, these blinds do not require operating cords - making them entirely child-safe. At Bristol Blinds, we work meticulously to ensure your blinds are installed correctly without delay. That's why we'll visit your property to rigorously check measurements before ordering and fitting your blinds. Because we're not limited in our ability to supply these fantastic products, we are able to serve both domestic and commercial customers with aplomb. Contact us today, in Filton, Bristol, for more information about the Intu™ and tilt and turn blinds we provide.